Another unfortunate event has made headlines. 13 students who were part of the Erasmus Student Network exchange program with University of Barcelona were killed in a bus crash early Sunday morning while on their way back from Fallas festivities in Valencia. After paying €20, students left Saturday morning to Valencia for a wonderful fireworks festival. There were 5 chartered busses that were bringing the students back early Sunday morning, but one was never to complete the journey home. At 6 a.m. Sunday morning, halfway between Valencia and Barcelona the driver of one of the chartered buses lost control while on the AP7 highway near Freginals. 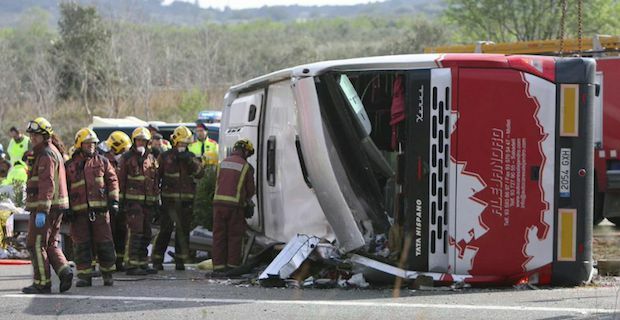 According to the Catalan Interior Minister Jordi Jane, the driver of the coach “hit the railing on the right and swerved to the left so violently that the bus veered onto the other side of the highway” and hit an oncoming car. According to the Mayor of Ulldecona, this area of the motorway is an “accident black spot". There was a total of 63 people involved in the accident. 28 are injured and 13, all females between the ages of 22-29, have been confirmed dead. Their nationalities have yet to be made public as they are still identifying the bodies. On that one bus there were 19 nationalities according to local Spanish officials. These included France, the Netherlands, Finland, Hungary, Germany, Sweden, Norway, Switzerland, the Czech Republic, New Zealand, the UK, Peru, Italy, Bulgaria, Poland, Ireland, Palestine, Japan and Ukraine. The driver who survived has since been taken to the local police station in Tortosa and was tested for alcohol and drugs, both came out negative. He has been a part of the company that chartered the buses for 17 years, all without any previous incidences. The University of Barcelona released a statement on Twitter saying “The #UniBarcelona sends its condolences to the families and relatives of the victims of today’s bus accident. We remain at your disposal for any further needs.” The president of Catalonia has declared 2 days of national mourning.